In our last article Your Daily Social Media Checklist, we mentioned how having a social media task list can boost your business: it keeps you organized, maintains communication with your audience, increases engagement with your followers, unites your teams, and demonstrates growth on multiple levels. Weekly #1: Have conversations with other leaders in your industry. You know who I’m talking about. That certain someone who always has their name cited in an article, or who appears on stage at every conference you’ve ever been to. Those individuals are the thought leaders in your industry. By mingling with those “big” names, you’re building up your brand. Connect with the industry giants via LinkedIn. Read, comment, and share their posts. After you’ve established a relationship, present this thought leader with possible ways you could co-market together. Whether that comes to fruition or now, you’ve learned what content their audience enjoys and have spend significant time brainstorming how you can better help your followers. Weekly #2: Brainstorm with your teammates. Speaking of brainstorming, you can start that process on your own, but you’re more likely to thrive if you include other like-minded colleagues. Bounce ideas off one another about unique content ideas. Start this process by organizing a meeting where all of the teams across your company can gather together to collaborate. Each team bears valuable knowledge and insights that can be beneficial to the marketing team. The employees who get face-time with the customers can share commonly asked questions. The sales team can add which features prospects are more interested in. These insights, large and small, will push your social media content to be of greater relevance to your audience. Weekly #3: Share your content on other sites. In B2B marketing, you can take a more holistic approach to produce an increase in website traffic or a broader audience reach. Go beyond simply distributing content on your own blog, email or social media platforms. Instead, reach out to other communities to get your content exposed organically. Other sites thrive on community (places like GrowthHackers, Medium or Inbound.org). You get to share your content and engage with other writers. Contribute to discussions, like or comment on other articles, and share those that you find interesting. Doing this not only gets your content out to more readers, but also boosts your reputation. Best part? You can share your articles on social media from both your website and these communities. Weekly #4: Repurpose existing content. There is more to marketing than crafting content and forgetting about it after it’s published. And there is hope when you’ve emptied your bucket of swell content ideas. Instead of hitting your head on the wall (ouch), revamp your old stuff with a fresh look and a new feel! It’s not as complicated as it sounds. Alter your top-trending blog post into a short video. Take your customer survey and turn it into an infographic. Use a recent video and write it into a blog post. Ta-da. The same content in a new form attracts a completely different audience. Weekly #5: Make your content interactive. ...Are you attracting the right audience? Does your content seem dull or get looked over in your saturated market? Take the B2C approach to get out of that funk! B2C marketers engage their audience with interactive marketing campaigns which both acquires and engages their followers. Leading consumer brands like Adidas and Nike understand the power behind interactive content. They posts polls, host live contests, and get people excitedly talking about their new products. Instead of boring marketing tactics, make your audience engage with you. Create an interactive quiz for your followers...but don’t reveal the answers until the tune in to your webinar. Host a poll and announce the results in a funny meme. Offer a giveaway for the follower who provides the best answer to you question. Weekly #6: Write a blog article. Social media marketers are hired for their witty posts and short snippets, not their long-form content. However, it can be rejuvenating to explore all areas of the marketing field, including blogs. Thankfully there is no stereotypical blog post. As long as it’s readable and relevant, you can take a breath of freedom. Place your personality in the article, share your creativity, offer your personal perspective on marketing (including your positive areas of growth as well as your dramatic areas of failure). After all, your audience needs to be reminded that there is a real person behind your company’s marketing. 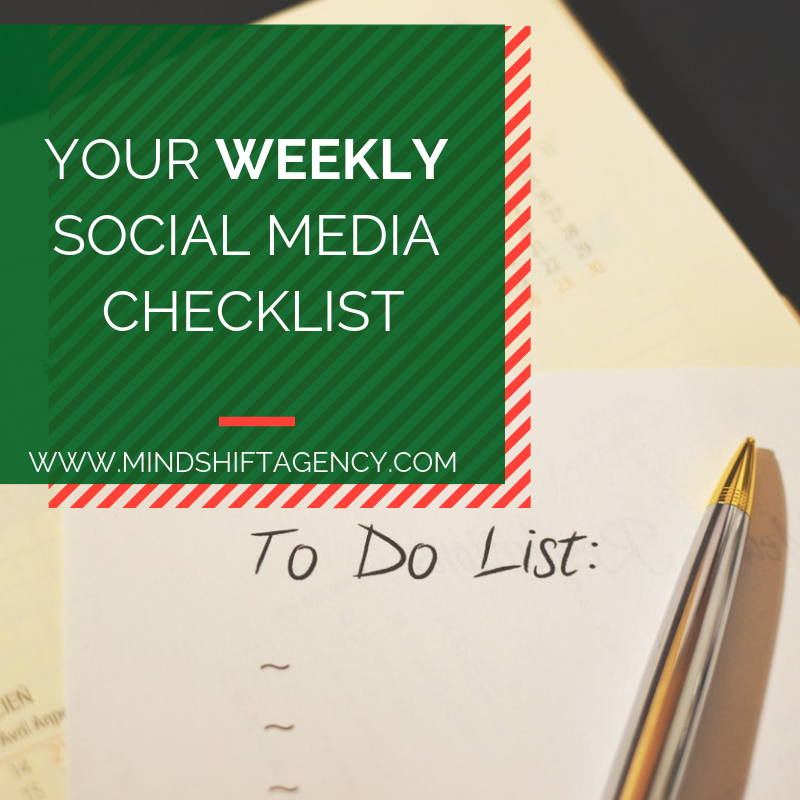 By now you’ve worked through both the daily and weekly social media checklist. You’re killin’ it! Don’t forget to follow along to see our monthly and quarterly checklists as well. Are you overwhelmed with your overflowing social media task list? Our MindShift experts can be your sherpa guide. We specialize in personalizing these checklists to your brand and walk you through each step of the journey. Your target audience is engaging on social media each day, so don’t wait another week to organize your social media marketing. We can help you today! Did you miss the first blog post in this series? Read the daily social media checklist, and be on the lookout for the monthly and quarterly ones as well!